Rinpoche and Ven. Roger Kunsang assessing the property at Buddha Amitabha Pure Land, Washington, USA. August 2008. Some gifts Rinpoche bought while travelling, June 2008. Visit the LZR Photo Gallery for more new pics. Rinpoche commented about the importance of meditation and gave advice to Ven. 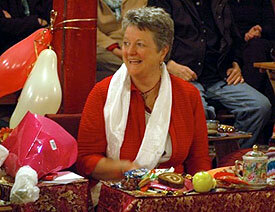 Birgit Lobsang Drime of the Basic Program at Istituto Lama Tsong Khapa in Italy. (First published in Mandala magazine, Aug-Sept 2008 issue). Also see Rinpoche’s other encouraging and inspiring advice to Basic Program students about the Benefits of retreat on lam-rim! When problems arise in the centers, between members, or between director and members, then it is very, very important from the very start to always have peaceful, good, compassionate communication with each other and consider each other. The director and staff in the center need to take care of everybody, any person at all, who comes to the center – be they casual visitors, old students, new students, staff, volunteers and most of all the teachers and geshes. Showing respect to all of them increases harmony in the center and in this way brings great benefit for everybody and makes the center flourish. Practicing guru devotion strongly brings many benefits and realization. So continuously practicing guru devotion is beneficial for one’s own mind and for all those around us. If sometimes what the guru tells us or asks from us is difficult, then all the teachers and members have to meet together, and discuss honestly and openly how to follow the guru’s suggestions. Avoid harsh speech to each other, and to the guru. The current Masters Program will be taking up Rinpoche’s advice to host a final comprehensive exam at the conclusion of their six years of study. Thanks to Istituto Lama Tzong Khapa Masters Program staff! We will soon be adding Spanish, French, and Czech translations to the Basic Program updates page on the website. from Rinpoche’s recent commitment to teach Atisha’s Lamp of the Path over the course of the next three years at Kadampa Center, USA. More information will be coming out on this soon. There are a number of exciting announcements concerning the Merit Box. First of all there was a total of $89,000 raised during the 2007 collection period. $55,000 has been distributed to a variety of centers and projects. Land of Medicine Buddha, Shine Land, Chenrezig Institute, Maitripa Institute, and Langri Tangpa have all received grants. There are more grants to be distributed in the near future. We are accepting new grant applications for the upcoming year from any center, project, service or study group that has a worthy project. Please contact Chuck Latimer, Merit Box Coordinator, for an application or other information. Finally, we are excited to announce the newly designed Merit Box that will be available in the near future. The practice booklet has been translated into 10 languages and there are 4 different languages on the Merit Box itself, French, Spanish, Chinese and English. We have worked very hard at making this practice accessible for as many people as possible. There will be a notice sent out to all the centers when the new boxes are available. Please take the time to rejoice in all this wonderful merit. 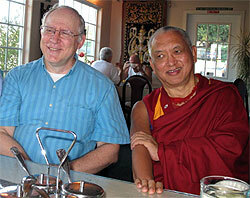 Rinpoche has lunch with very old (not in age) and devoted student, Jon Landaw. An FPMT Translation and Editorial Committee has been named and we are very pleased to be going forward with Ven. Fedor Stracke, Ven. Namdak, Ven. Joan Nicell, Conni Kraus, and Jon Landaw as our experts in the field of translation and editing. The extremely important task of this committee first and foremost will be to establish a glossary of terms for all FPMT curriculum translations. More information coming. Mandala’s first quarterly issue – October-December 2008 – goes to press this week with a cover feature on “The First Turning of the Wheel”. We asked practitioners: “When and how did the wheel of the Dharma first turn for you?” Their stories of connection are inspiring, funny, moving, and they resonate with the intensity that many of us feel in our first exploration of the Dharma. Geshe Tashi Tsering of Chenrezig Institute and scholar Jim Blumenthal round out the feature with skillful summaries of the four noble truths, as well as the philosophy and historical context of all three turnings of the wheel. This issue additionally offers a robust Youth feature which presents many ways in which FPMT is preparing the next generation to enter the world with love and kindness alive in their hearts. 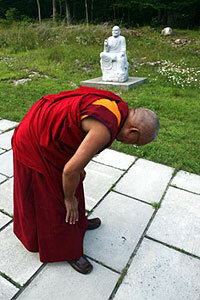 You’ll also find a thorough presentation of emptiness by Lama Zopa Rinpoche in his “Letter from Rinpoche”. Thanks to your support, Mandala is excited to announce that we will be debuting our new e-zine (electronic magazine) for Foundation Members in late November 2008, which will be followed in early December by our January-March 2009 print issue. Stay tuned for more details! Lama Chopa Survey – Thank you SO much to the 127 respondents to our Lama Chopa survey. The conclusion from the information gathered is that we will keep all of Rinpoche’s advice (additions) within the text AND we will make great effort to reformat the text in a way that it is easier to follow. International Sangha Day Survey – Many thanks to all who responded to our survey about FPMT’s International Sangha Day! More information based on your responses will come soon. In response to a request from FPMT Australia, we have created a beautiful certificate, signed by Rinpoche, which FPMT center, projects and services can use to acknowledge and honor precious volunteers. The certificate has space for you to write the volunteer’s name, and the center/project/service name so that it can be personalized to your special volunteer. print ready with bleed lines etc, which can go to a printer to be professionally printed. a version without the bleed lines so it can be directly printed on your own printer. We hope that this is a helpful addition to the Volunteer Kit! 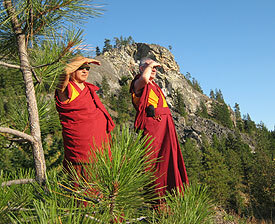 (That and more Volunteer Support information is available under Center Management in the FPMT Affiliates Area). A one day Inner Job Description (IJD) will kick off the North America Regional Meeting in Portland November 24 – 26 led by Amy Cayton. Just a reminder of a fantastic opportunity for your center/project to get training in publishing and media design technology from Harald Weichart. Harald is Austrian, and can train in English and German. Harald is available from October 2008 to approx. March 2009. He is offering his time for free, and needs travel, food and accommodation costs covered. In order to facilitate requests for training, Harald has created a brief survey, which includes more information about the time needed for each training – if your center didn’t see the details sent by Claire on the CPMT egroup, please email me and I will send it on to you. We understand that some of you may not have time to read this newssheet in detail each month – though we hope you do read it! We hope you will agree that it is crucial that (if you don’t have time) that someone at the center takes responsibility to read it through each time and to give you key updates, as the News includes important new advice from Rinpoche and new program/materials information. Also we are thrilled that many centers forward the FPMT News to their subscribers, and to see that many centers and projects take relevant chunks from the FPMT News to use in their own e-news and newssheets/magazines – fantastic! We hope you saw, and found useful, the compiled key advice given by Rinpoche in the last 6 months. If any FPMT teachers missed it, please write to Claire. “I am delighted to announce that LRZTP has a new home in Dharamsala, close to the Library of Tibetan Works and Archives. We are located in what was formerly part of the Rato Chuwar Labrang, at the end of a pathway just down from Delek Hospital. It is a lovely two story building with wide verandas, wrought iron railings, a courtyard and rooftop with a view. Eighteen fortunate students will begin their two year classroom studies November 3, 2008. The class will have representatives from 12 nationalities, with several students already sponsored by the FPMT centers noted below. Please rejoice!! The Amdo Eye Center building is nearly finished! The whitewashing of the whole building is complete and the inside of the building is being completed. Recently the boiler, switchboard, radiator, and water supply facilities were installed. The construction is on schedule and within budget. 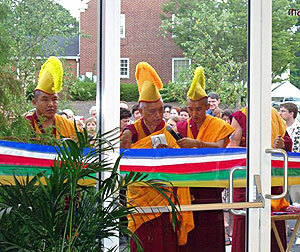 In August 2008, FPMT sent an installation payment of US$90,000 to the Amdo Eye Clinic. This is the third progress payment. We still need $210,000 to complete and equip the building. The International Sangha Prayers for World Peace, the International Mahayana Institute (IMI) community’s offering to celebrate FPMT International Sangha Day, had over 500 participants in the prayers. A total of 1,674 recitations of the Sutra of Golden Light were offered (and confirmed) for world peace. Rejoice in this wonderful offering to our teachers, to our leaders and to our fellow sentient beings. David Andrews, who retired as director of Tara Institute, Australia after almost 7 years of service, said the thing he will miss most is thanking people. There are currently three opportunities to join the team at FPMT International Office – we are looking for a Director of Finance, Managing Editor for Mandala Magazine, and Technology Professional/s. New SPC Sophie Lacroix is at Gendun Drupa Center, SWITZERLAND (not Gendun Drubpa Study Group, Canada!). Apologies!